My grand slam trophy. With so many ultra to choose from nowadays, running the four oldest 100s in one summer felt really special. I came close to earning my urn, but survived! A race for the responsible ultra runners who think ahead! Awards are meant to hold what’s left of you once you expire. Each urn is lovingly hand crafted and 100 percent sustainable, for you to take home until you need it. In the event that you die on the course of the Earn Your Urn, cremation following the event is complimentary. Your ashes will then be scattered on the trail, which will improve the footing for next year. The empty urn will be recycled for the next runner who draws his last breath during this race. Run on, knowing that your long-suffering loved ones at least won’t have to worry about how to dispose of your remains! If this sort of terrain is not your thing, don’t worry! 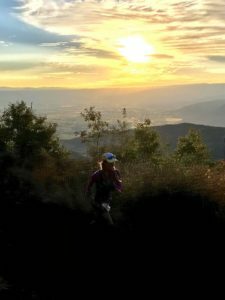 You can still be an ultra runner. Are you no longer satisfied with running marathons? 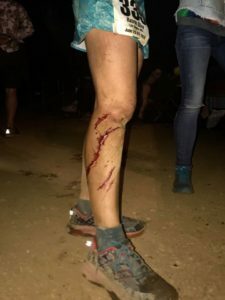 Are you longing to call yourself an ultra runner, yet terrified of signing up for one of those races that sound like they will result in your almost certain demise (see above)? Are you secretly a lot more normal than those crazed, obsessed100-mile runners you’ve met? This race is for you! A flat, smooth, suburban marathon with an extra city block added at the end. Guaranteed to not require more effort or training than a regular 26.2. Bask in your ultra running glory while preserving your sanity, your quads, and your work-life balance. 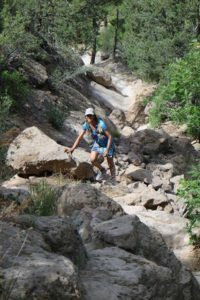 Cross “Run an ultra marathon” off your bucket list with a clear conscience, but without unnecessary suffering. 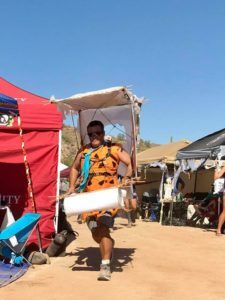 Not a hallucination: this guy really ran the Javelina 100 in a Fred Flintstone costume. Wow! Are all the things you see that aren’t really there your favorite part of running ultras? This race will deliver more intense hallucinations than any other, guaranteed or your entry fee back. 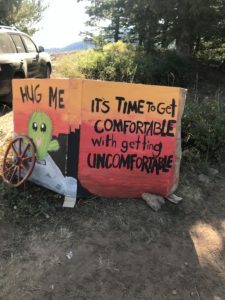 Aid stations will not only stock expected items like gummy worms and ramen noodles, but also an assortment of THC, LSD, magic mushrooms, and assorted bottles of Tequila. Pain is totally optional in this race! (Disclaimer: race management is not responsible for any bad trips runners might experience, nor for runners getting too confused to find the course flags. We can help you find yourself, but we can’t help you find the trail if you’re too stoned to pay attention). 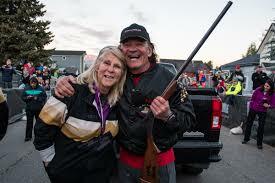 Ken Chlouber and Merilee Maupin at the finish line of the Leadville 100. Ken’s shotgun does not kill runners, it just destroys their hopes and dreams of finishing if they’re still slogging up the Boulevard when they hear the blast. Because running an ultra is not exciting enough on its own, we throw in extra thrills. Sign up for this race if you want to dodge arrows and bullets over the course of 50 miles. Any plain old ultra makes you feel glad to be alive – this one will make you positively ecstatic, if you survive it. 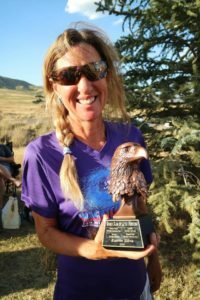 Held every October on multi-use public lands in the middle of nowhere, the Hunting Season 50 promises a fun day for participants and spectators alike. Though a herd of 250 ultra runners will be moving through the forest on race day, no permits for hunting them will officially be given out. This doesn’t mean no one will try. Wear bright orange. If you don’t (and even if you do) you might leave the course strapped to the hood of someone’s Dodge Ram. The “Best Carnage” award is given to the runner finishing with the most shotgun pellets embedded under the skin. Ultras are not for sissies. Are you one of those ultra curmudgeons who think modern races have become way too easy, and modern runners way too self-indulgent? This one’s for you! Course markings are few and far between, so pay attention and carry emergency supplies that allow you to bivouac in the woods if you have to. Aid stations will be spaced 20-plus miles apart. They will stock water until they run out, plus a box of saltine crackers if you’re lucky. Be prepared to carry your own food, hydration, and anything else you might need. Better yet, be prepared to catch wild squirrels and eat them on the run. Awards are made from sticks and mud found on the course. The timing system is a sun dial, so if you’re out on the course after dark, your finish time will be very approximate. Enjoy! 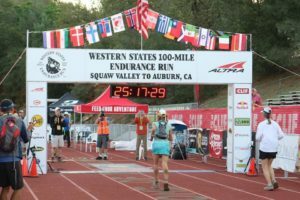 Yes, I got into Western States last year – worth all the pain and suffering, and then some. Definitely. Finally, a 100 with lottery odds so low that you can throw your name into the hat with confidence, secure in the knowledge that you will not actually have to run this race anytime soon. Of the 150 available spots, most are reserved for qualified elite runners, close friends and family members of the race committee, or race veterans who run have run it every year since 1987. You can’t, of course, be 100 percent sure you won’t get in, but 99.9 percent is almost as good. If you feel the pressure to sign up for a 100, but know that you won’t have enough time or motivation to train for one, this lottery offers an easy way out. All you have to do is fake disappointment. Hey, at least you tried! Which other races do we need? Please feel free to add to the list! May everyone run happy in 2019! This entry was posted in Uncategorized on January 1, 2019 by silvakat. Isn’t that last race called Hardrock?